MIAMI, June 5, 2018 /PRNewswire/ -- Carnival Corporation & plc (NYSE/LSE: CCL; NYSE: CUK), the world's largest leisure travel company, today announced that its Center for Simulator Maritime Training (CSMART) Academy has been recognized as the world's first Center of Safety Excellence by DNV GL, the world's leading classification society and a recognized advisor for the maritime industry. 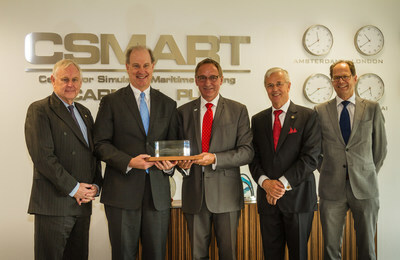 The award was presented today by Paal Johansen, global cruise ship director DNV GL – Maritime, at a ceremony at the CSMART Academy in Almere, the Netherlands, outside of Amsterdam. Accepting on behalf of the CSMART Academy were Vice Admiral Bill Burke (ret. ), chief maritime officer for Carnival Corporation; David Christie, senior vice president of maritime quality assurance for Carnival Corporation; and Captain Hans Hederström, managing director of the CSMART Academy. Carnival Corporation's CSMART Academy is the world-renowned maritime training, professional development and research facility that is part of the seven-acre Arison Maritime Center. Founded in 2009 and staffed with one of the world's most experienced maritime training faculties, the CSMART Academy provides rigorous annual safety training for nearly 7,000 bridge and engineering officers responsible for the navigation and operation of the world's largest fleet of cruise ships from the corporation's nine cruise line brands – Carnival Cruise Line, Princess Cruises, Holland America Line, Seabourn, P&O Cruises (Australia), Costa Cruises, AIDA Cruises, P&O Cruises (UK) and Cunard. "Carnival Corporation and its cruise line brands have made a strong commitment to safety, exemplified by its investments in training and personnel development in its CSMART Academy," said Knut Ørbeck-Nilssen, CEO of DNV GL - Maritime. "Carnival Corporation's organizational focus on continuous improvement throughout their officers' careers, and the innovative application of training simulators, is a testament to their drive to go beyond compliance. We are pleased to present CSMART Academy with our Center of Safety Excellence award. It is very well deserved." "We are honored by this recognition of our relentless commitment to the safety and comfort of our guests as the top priority for all of Carnival Corporation's cruise line brands," said Hederström. "Our CSMART Academy faculty and staff include some of the world's top maritime experts, and we are privileged to support the ongoing training of the bridge and engineering officers from each of our nine cruise line brands. It is all made possible by our corporation's collective commitment to safety and significant investment in innovative simulator equipment, technology, instructional tools and curriculum." and introduction of innovative concepts to improve maritime safety. The first three categories were supported by DNV GL Seaskill with standards including learning program (0008), simulator instructors (0025), training provider (0029) and simulator product certification (0033). The CSMART Academy's core faculty of 47 instructors is complemented by more than two dozen trained line instructors who alternate working on board a cruise ship with instructing at the CSMART Academy, creating a unique process for real-time information exchanges between instructors and officers at sea. Additionally, the Fleet Captain and Fleet Engineer programs train 10 captains and 10 chief engineers, who then spend two to three years traveling among ships in the Carnival Corporation fleet, verifying that CSMART Academy training is practiced and maximized at sea. The CSMART Academy currently offers 36 different training courses, well above the courses required by regulatory bodies. As part of the voluntary certification by DNV GL, constructive feedback was given towards improving the development of the CSMART Academy's training courses, such as defining measurable objectives and increasing transparency in course documentation. The CSMART Academy features four full-mission bridge simulators, four full-mission engine room simulators, eight smaller part-task bridge simulators and 36 part-task engine room simulators – all of which can recreate a variety of scenarios and sea conditions at 60 different seaports around the world. These simulators are used to train bridge and engineering officers, including simulations focused on engine room and engine control room operations, environmental systems and exhaust gas cleaning systems. The simulators were certified against DNV GL standards, with the assessors praising the resemblance to ships' operations and the high level of realism. DNV GL found that the CSMART Academy's Management System had well-defined processes, and clear and concise procedures to enhance consistency in training development, delivery and evaluation, resulting in the CSMART Academy and its faculty providing training to a very high standard. An important component of the work of the CSMART Academy's faculty is pioneering the cruise industry's first continuous development simulator-based appraisal program. Completing the weeklong course as part of the company's continuous professional development matrix is a mandatory requirement for every maritime officer from each of Carnival Corporation's nine cruise line brands, exceeding regulatory requirements. The CSMART Academy also hosts a comprehensive port study program, bringing together bridge teams and local pilots to agree on a pilotage plan and assess the risk of entering and departing a port under challenging conditions. pioneering the team- and role-based concept for bridge and engine room management in the cruise and shipping industries. a new way to plan navigation in confined waters, designed to enable timely and unambiguous interventions between team members as soon as deviations occur. a new continuous development program for bridge, engine and electrical officers, inspired by the aviation and nuclear power industries' approach to recurrent training and validation of competencies. three new sophisticated engine room models, replicating new ships to the Carnival Corporation fleet, developed together with simulator provider Transas. The virtual reality application reproduces a 150-meter-long engine room and its systems. integration of actual 11,000- and 690-volt switchboard equipment with virtual equipment, simulating the electrical distribution on board vessels that meet the IMO's Safe Return to Port regulation. These simulators are used to deliver high voltage management training, diesel electrical propulsion and advanced electrical systems courses. full-mission simulators are incorporated to enhance training for environmental officers, and part-task simulators are used for training on exhaust gas cleaning systems, whose capability to cleanse exhaust gas fumes for clean air emissions is a critical part of the corporation's commitment to sustainability and environmental leadership. incorporation of training for liquefied natural gas (LNG), a new fuel technology being pioneered in the cruise industry by Carnival Corporation and its brands. Several of the company's cruise lines have LNG-fueled cruise ships scheduled to being in operational service in coming years, starting with the first fully LNG-powered ship later this year. Additional information on the Arison Maritime Center and the CSMART Academy can be found at www.csmartalmere.com. DNV GL is a global quality assurance and risk management company. Driven by the purpose of safeguarding life, property and the environment, it enables customers to advance the safety and sustainability of their business. Operating in more than 100 countries, the company's professionals are dedicated to helping customers in the maritime, oil & gas, power and renewables and other industries to make the world safer, smarter and greener. DNV GL is the world's leading classification society and a recognized advisor for the maritime industry. The company enhances safety, quality, energy efficiency and environmental performance of the global shipping industry – across all vessel types and offshore structures. It invests heavily in research and development to find solutions, together with the industry, that address strategic, operational or regulatory challenges.